Defensively, it was a tidy match for Manchester City. They won the second balls and the spacing between midfield and attack was well maintained. However not everything was perfect defensively, knee injuries continue to plague the squad and specifically the defence. John Stones, Pablo Zabaleta, Vincent Kompany, and Ilkay Gundogan have now all suffered knee injuries. To make matters more frustrating, Stones’ injury arrives right after his return to the side and marks an issue that has persisted for seasons, that injuries are preventing City from establishing defensive partnerships. 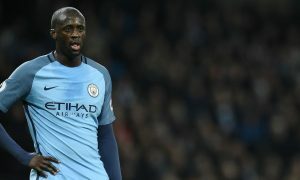 The best sides have established communication and coordination between defenders which make partnerships click and City have not had a reliable centre-back partnership since Nastasic and Kompany, back in the Mancini era. Switching wings, we saw both sides of Raheem Sterling today. For me, Sterling is his own worst enemy, something he showed in the first half. He struggled to get involved and often looked reluctant to take a chance or take on his man. After half-time, however, he instantly looked a different player. He put in a dangerous cross within minutes of the second half. He looked way more confident and when he took his man on, he subsequently won the penalty to give City the lead. 1v1 wing play is a vital dynamic in any Pep team, look no further than his time with Bayern Munich. We’ve seen plenty of improvement from Sterling and he is capable of so much more, especially when he’s confident in himself. Kelechi proved to be a useful substitution today, exhibiting his movement and poacher instincts for the second goal. De Bruyne was metronomic as ever, keeping City’s attack ticking, especially in transition. This was no more clear than De Bruyne signaling to Kelechi to move centrally in order to slip in Silva. The match took on an attacking pattern we should come to expect from Manchester City. Sustained possession for most of the match and once taking the lead, resorting to transitions to increase the lead. It has proven to be the best combination of Pep’s play style and the lightning pace of the Premier League. City have the pace and with De Bruyne and Silva, players with the ability to unlock defences. For all the talk of adaptation to the Premier League, perhaps Pep is finally finding the right balance in defence and attack. Which could not have come at a better time, with the New Year’s Eve clash with Liverpool approaching.